I couldn’t resist buying some mums a few weeks ago for my kitchen island centerpiece. They looked so pretty! However, the mums didn’t appreciate the lack of sunlight and I didn’t appreciate the mess when I watered them. It’s time to replace the mums with something that will last longer. 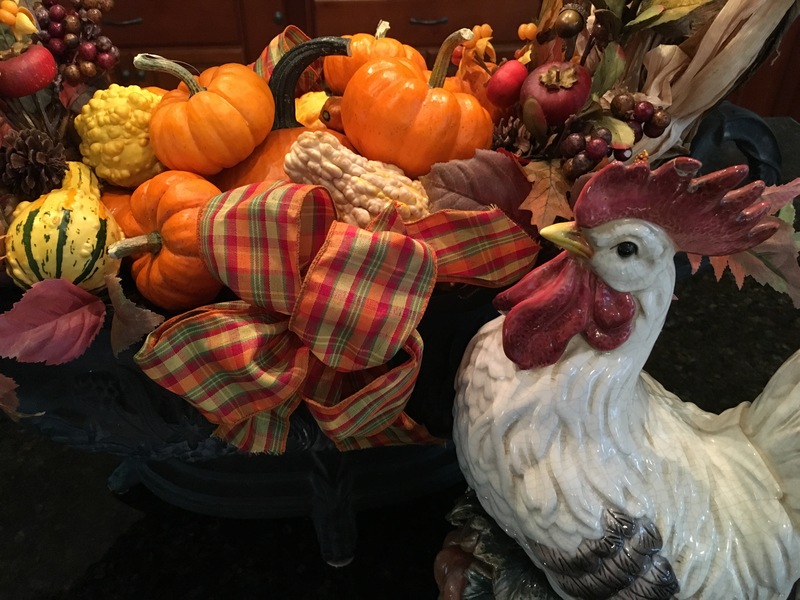 Time for a new fall centerpiece! The mums from the island centerpiece were looking a bit peaked so I put them outside. Now they can enjoy the sunshine and rain as they should! I’m replacing them with some miniature pumpkins, decorative gourds and dried corn. In order to make the pumpkins and gourds last longer, I soaked them in a mixture of water and bleach at approximately a 10 to 1 ratio. (10 parts water to one part bleach) I did this in my kitchen sink. I figure the sink could use some sanitizing at the same time! The pumpkins and gourds soaked for about 15 minutes. I drained the water solution and let them drip dry. Once dry, I rubbed each one with a soft towel and a bit of petroleum jelly. (vaseline) This gives them a nice shine and protective coat. This is my favorite urn of all time! I bought it years ago from a Wisteria catalog and it is SUPER heavy. (They probably discontinued it because of the weight and shipping costs.) I use it year round as the base for my seasonal decorations. I put felt feet on the bottom so I don’t scratch my granite when I’m cleaning or filling the urn. Since the urn is deep, I used old plastic bags from the grocery store as filler so I didn’t need to use more pumpkins than necessary. I put three dried Indian corn with husks at each side handle and then filled in with my pumpkins and gourds. Again I used one larger pumpkin to take up space. I have some fall picks that I use year after year and I stuck a few of those in to fill in the blanks. I used some chop sticks to hold the ribbon in place. Because we walk around the island all of the time I wanted it to look nice from all angles. My rooster came in from the laundry room to add some color and fun. I looked high and low for some fresh winterberry but I don’t think it’s out yet. Once I find some I will fill in the middle to add some height and a bit more orange. I love how it turned out! It’s hard to beat Mother Nature’s beauty! Phantom Book Club-Coming soon to my neighborhood!